First photo of good quality this season, entitled to almost everything that is expected in a reasonable Saturn, equatorial bands, very distinct, Ring of Crepe and mainly hexagon perfectly outlined with the very distinguished eye in its center. Stunning images Avani! And do I see the Encke Gap on the right side of the A Ring, or is it the Encke Minima? I'm never really sure. 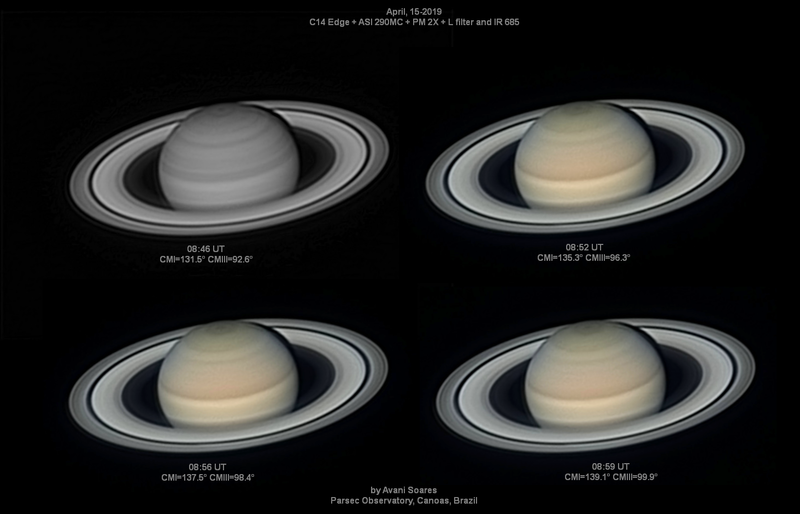 I've been studying Damien Peach's images of Saturn and I have to say yours are just as good if not better than his, amazing! Wonderful images of an amazing world. As much as I enjoy looking up at Luna, could you imagine the sight of those rings overhead! It would be breath taking! Damian is Damian, still number 1! He and Chris Goo have always been my point of reference. A magnificent pair. The colour image is particularly pleasing. We're still at the beginning of the season! Indeed! These are excellent too. Saturn is the god of plenty and it shows.